When I was told recently that a new catering company had started up in Edinburgh, specialising in Middle Eastern food, and that I was invited to try some, I couldn’t wait. 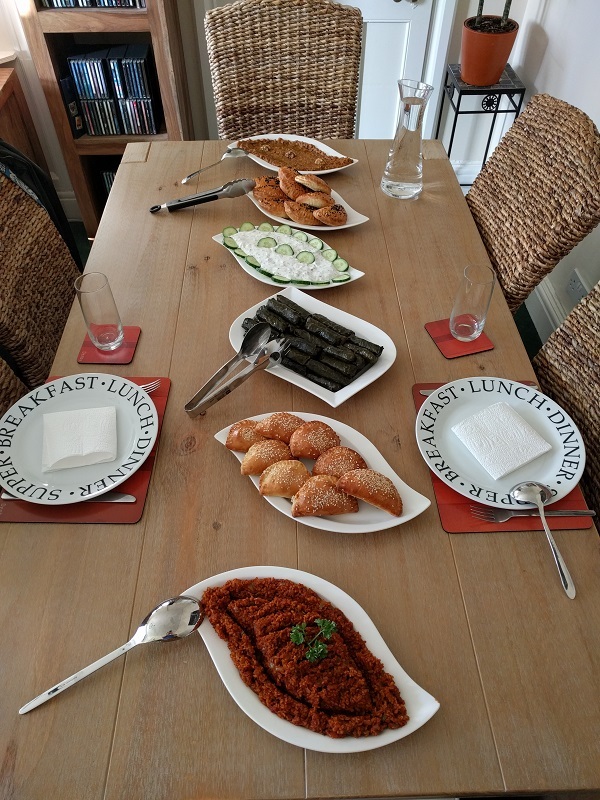 Middle Eastern food has long been a favourite of mine and so the prospect of trying some of Dalita’s home made dishes was too good to pass up. Before I was even through the front door of her home, the fragrance of spices wafting out told me I was in for a treat. One of the things which makes Dalo’s Cuisine so impressive is that Dalita does all of the cooking from scratch in her kitchen at home so that everything is as fresh as possible. I was glad I’d skipped breakfast as there was a veritable feast waiting for me. The first thing we got stuck into was a bulgur wheat salad with mixed vegetables and pepper paste. The sweetness of tomato and vegetables was offset by the smokiness of the pepper paste, while the bulgur wheat itself had a lovely soft texture. I could quite happily have sat and devoured the entire plate if not for the fact that there were so many other items to tempt me. 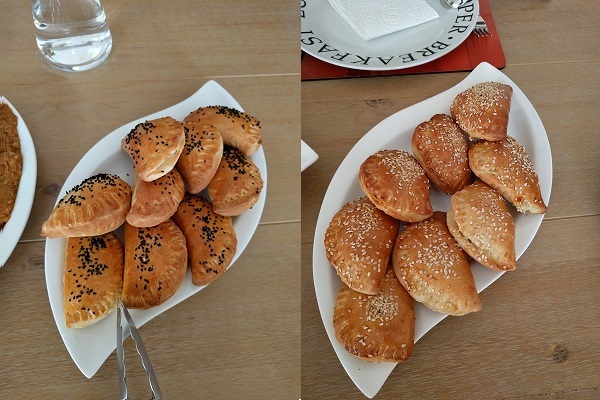 Next to try were the borak: a yeasted dough wrapped around two different varieties of filling. The olive and pomegranate was my favourite of the two as the savoury, salty flavour of the olives was wonderful with the acidity of the pomegranate glaze. The dough surrounding the filling was excellent as well, soft but with a little bit of bite to it. The feta and parsley was good as well, although I felt the filling was perhaps a little bit dry. 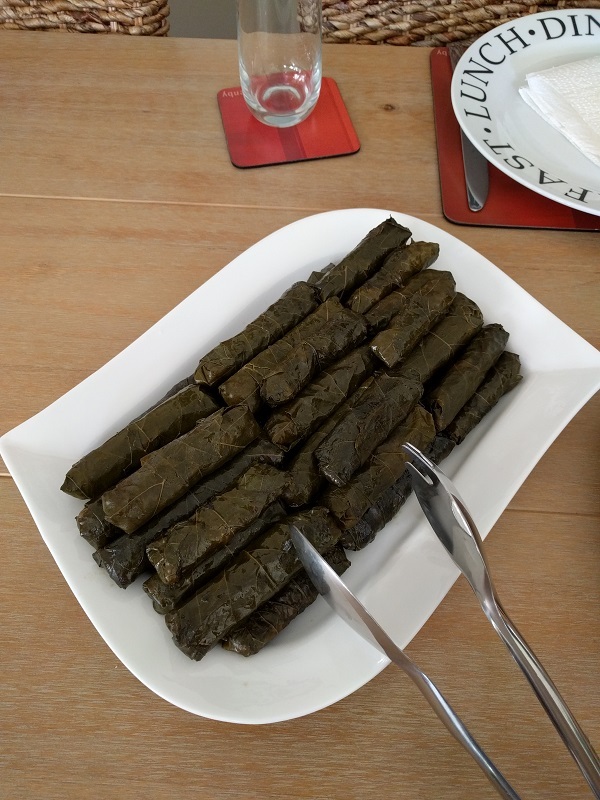 I was slightly apprehensive when it came to the stuffed vine leaves as I have sometimes found them to be somewhat bland, the leaves overcooked and falling apart. That was not the case with these, however. The filling was mostly vegetables and spices, with very little rice to hold it together, and the leaves had maintained some texture rather than feeling like mush. Once again, Dalita’s deftness with spicing was on show, with every dish having a distinct spice and flavour profile. We then moved on to the dips: rich and luscious muhammara and yoghurt dip with cucumbers. The yoghurt dip was less able to stand on its own than the other dishes, but was still very tasty and would be a good accompaniment to some fresh pita as a starter. 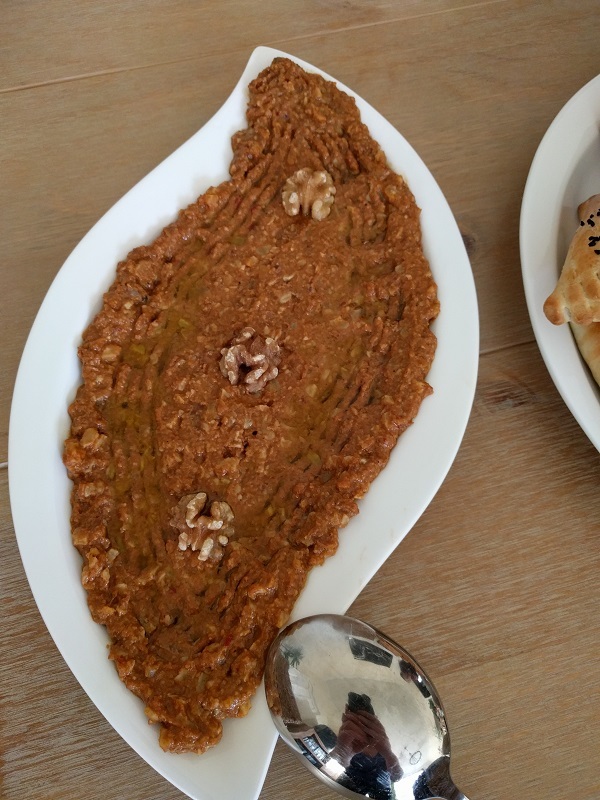 The muhammara was absolutely delicious; slightly bitter from the walnuts but with a mellow sweetness from the peppers as well and an indulgent mouth feel similar to crunchy peanut butter. By this point, I was almost too full to consider more food, but Dalita’s sweets were too tempting, particularly when accompanied by a mug of black tea spiced with cinnamon and cloves. Once again all the pastry was made from scratch, and had a wonderful crumbly texture to it. Pictures above are lokum (or turkish delight) domes, lokum wraps, and date klicha. My favourite from this plate was probably the date klicha, which had a deep, almost chocolate-y flavour which combined wonderfully with the pastry. 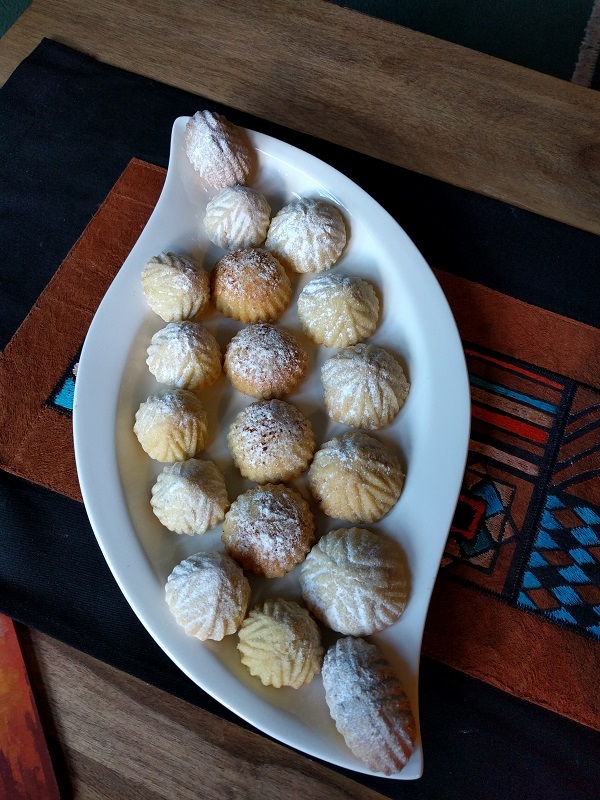 There were also maamoul, which were more like a crumbly biscuit, having been made with semolina. 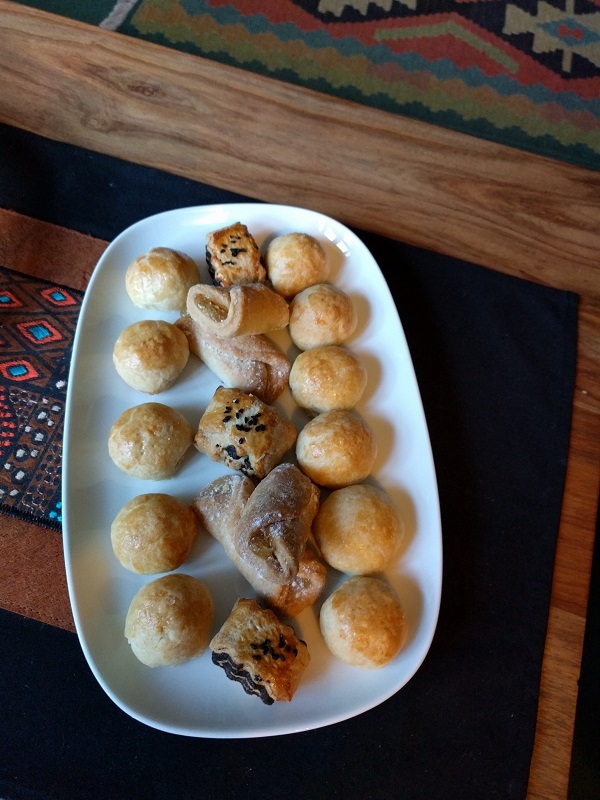 I have had baklava on many occasions (and Dalita makes her own baklava as well) but these sweets were new to me and very enjoyable. I left Dalita’s home incredibly satisfied with a box of extra sweets (which were rapidly devoured by my gannet-like friends). I am still astonished at the quality and quantity of food that she is able to produce from home and from scratch. Her passion for and knowledge of Middle Eastern food are glaringly obvious and, in my opinion, anyone who enjoys this type of food should endeavour to try hers. You can do this by hiring her to cater an event or finding her food in the Edinburgh University shops at Potterrow and King’s Buildings. She can also be found at the Maker’s Market in Morningside on occasion; check her Facebook page for details. For a menu and additional information, check the website. Follow Dalo’s Cuisine on Facebook. Last updated by Slaine at January 1, 2016 .